A lot of people are interested in the decision of the Court of Session in Advocate General of Scotland v Murray Group Holdings and others. A lot of people. On the 8th of April, at the height of the 2015 General Election campaign, Ed Balls appeared on the Today programme on Radio 4 to launch Labour’s proposal to ‘abolish’ (as he put it) the non-dom rule. The real question was whether that measure would cost money or raise money. He cited a post on this blog in which I argued that such a measure might well raise £1bn. It was the only evidence he had. I spent the whole day in media studios talking about that £1bn figure. As I write, that post on the key question around one of the highest profile policies announced in the General Election campaign, a post which has been ‘up’ for over seven months, has been read 6,911 times. And a post about a tax decision of the Court of Session ‘On EBT and Rangers FC – Pt 1‘ has been read 14,246 times. And it’s been up for six days. Clearly, what is perceived to be at stake is the reputation of the club. Did it “cheat”, as Alex Thompson and others have argued? Did the club’s directors, by trying to reduce its tax bill, imperil its claim to past titles? Did the club do anything ‘wrong’? I could offer some answers to those questions. But my views would be ill-informed: I have not followed the story. To offer them would be crass: I know nothing of Glasgow or its football culture. And my expertise is as a tax lawyer: I’m not a moral philosopher. But what strikes me is this. You won’t find the answers to those questions in the decision of the Court of the Session. You won’t find them in whether the liquidators decide to appeal that decision. Nor in a decision of the Supreme Court. Not one that overturns the decision of the Court of Session; and not one that upholds it. You find the moral quality of an action only in its actors. At what they did at the time and why they did it. The man or woman who drafted the tax code knows nothing of morality. The administrator of BDO cares nothing for football titles. The judges in the Supreme Court seek only to apply the law. And whatever the directors of Rangers FC lost for its fans, and for Scottish football, when they embarked on an attempt to avoid tax won’t be regained by a legal decision that they succeeded in that attempt. And nor will it be lost afresh by a decision that they failed. Put shortly, the conduct of Rangers’ directors won’t be bad if the liquidators decide not to appeal. And good if the Supreme Court overturns the decision of the Court of Session. It is what is, either way. I have campaigned against tax avoidance at some professional cost to myself: you can read about that here. And I have taken steps to expose the dishonesty of a small number of my colleagues at the tax bar. You can read about that here. But I have also recognised that a climate in which tax avoidance goes unchecked – and the use of EBTs was then commonplace – can encourage avoidance amongst those who would not otherwise contemplate it. And that there are circumstances in which even the best informed can find it impossible to ascertain the likely attitude of HMRC to a transaction they are contemplating. You’ll all have your views on which side of the moral line the conduct of the directors of Rangers falls. It’s not for me to try and change your minds. Enough for me to identify the right question. Which has got nothing to do with tax law. Note: I discussed, on Sportsound, last night many of the issues raised by this post. You can listen to the podcast, for a period of time, here. Today, over six pages, the Sunday Times has shown that a number of professional footballers face financial ruin because they participated in so-called film schemes. If you were earning a lot of money during the late 90s and early 00s and had an IFA I can almost guarantee you would have been offered the opportunity to participate in a film scheme. They were sold – almost without exception – as opportunities for the wealthy to mitigate (less politely, cut) their tax bill. I have a long standing, dual, interest in film schemes. First, I have been involved in litigating almost all – if not all – of them. Second, through a series of posts on this blog, I have written about the many interesting questions that they raise. Writing here and here I sought to bring a more nuanced perspective to the question whether those who invest in film schemes are getting what they deserve. Writing here I examined the crowd-dynamic that lead so many to embark on tax avoidance schemes. I’ve also written on how you solve these problems here, here, here and elsewhere. But the most important piece I have written is this one. In it I point the finger at a small group of real villains: some members of my own profession. I invite you to read it. But the reason I write this morning is this. I applaud the decision of the Sunday Times to give this story the prominence it deserves. The basic argument is that a number of footballers face financial ruin through no fault of their own. I have no doubt that that argument is right. And the story of working class kids who work hard and succeed as brilliant athlete or musicians but lose it all due to the actions of their advisers is familiar through the ages. But it continues to have a powerful resonance for me – and I suspect for many of you. I have worked with the Sunday Times on this story, I am quoted in it, and I applaud it. But I do want to add an important postscript. To focus on two financial advisers – named in the Sunday Times as David McKee and Kevin McMenamin – is to miss the broader story. Tax barristers got rich through devising these schemes – and are not being held to account. I showed this here. In that same post, I pointed out the promoters who devised these schemes may have made £100 million from a single idea. And although many of them may have been wound up, the individuals who ran them will have walked away with fortunes. It is very difficult to hold them to account as I pointed out here. IFAs, too, have wound themselves up – and the individuals involved have walked away wealthy. And Government too has achieved its policy objectives. (that’s an extract from this Decision). The very films Government sought to encourage were made – but Government has (in some cases at least) refused to honour its side of the clear and explicit bargain it struck with investors. I have explored this theme in more detail here. So it’s not just David McKee and Kevin McMenamin – about whom I know nothing beyond that which is reported in the Sunday Times – whose conduct is amenable of criticism. Everyone involved – those who created the environment for these schemes, those who devised them, advised on them, administered them, and sold them – bears a share of the blame. And they also share responsibility for the plight of the victims at the bottom. I’ve tried in leaden-footed legalese to express this sentiment. But don’t waste your time. Listen instead to Dylan on Who Killed Davey Moore. Writing here, I explained how Employee Benefits Trust work and why they were used for tax planning. But I also promised to try and explain why the decision of the Court of Session in the Rangers case seems to me to be wrong. And to look at what happens next. If you’re a tax specialist you’ll also need to make allowances for the fact that this piece isn’t written for you. I make no apologies for not capturing in these posts the full technical detail around Employee Benefits Trusts. As I said in Part 1, to have a liability to pay income tax you need to have something that is “income” – but you also need to “get” that thing. If you work hard for three years and your employer pays you a bonus in year three because of all of that work do you have a liability to pay income tax in year one? There is income from that year, after all? I give you this example because what I think the Court of Session has got wrong, in summary, is to focus too much on the income and too little on the getting. But let me take it a bit more slowly. What happens at 1 is that the employer gives money to the trust – think of it as a big pot – for all employees. At 2 the trust gives money to the sub-trust – a smaller pot – for a particular employee and his family. And at 3 the sub-trust lends the money to the employee. So when does the employee “get” the income? When does he have a liability to pay income tax? Of course he gets his hands on the cash at 3. But all the courts so far have held that what he has is a loan of the money – which he may need to repay. And at 2 the money is passed to the sub-trust for the benefit of the employee and his family. But all the courts so far have held that the employee hasn’t got it – because the trust might decide to give it to someone else – for example his daughter – instead. Now everyone involved kind of knew the money would just flow straight through from employer to trust to sub-trust to employee. And the loans don’t look the same as a loan you might take from a bank – no-one’s been demanding that the loans should be repaid. So you might feel that what the courts have held doesn’t have much reality to it. But as I said on Good Morning Scotland, the law isn’t always about common-sense. And what’s more important now is that they’re not conclusions a judge can overturn on an appeal. So what about at 1? Might there be a payment there? Because the new argument HMRC advanced before the Court of Session was that the employees got the income at 1. But how, you might ask, could they have got it at 1 if they didn’t get it at 2? Isn’t it odd that at 1 it could have been given to any employee but at 2 it could only have been given to the employee or his family? How could it be the employee’s income at 1 if it wasn’t at 2? Well, the answer the Court of Session gave was this. You can satisfy the “getting” bit of the test for a liability for income tax in two ways. You can satisfy it if you get the money yourself. Or you can satisfy it if you agree that it should be paid to someone else. There’s definitely something to this argument as a matter of principle. Think about it this way. Most of you won’t receive your wages through some complex EBT structure. Most of you will receive them directly from your employer. And you couldn’t avoid income tax on them by agreeing that they should be paid into your daughter’s bank account rather than your own. And what the Court of Session said had happened here was, in effect, that the employees had agreed that they should be paid into the EBT (at 1) rather than to them. And by agreeing, they had satisfied the requirement that they “get” the income. But, although that might be right in principle I have some problems with the practice. The first is that the Court of Session seems to me to see the “getting” requirement as a problem to be solved rather than a key part of the question. And I think this may have led it to the second and third problems. The second is that the Court of Session is not terribly clear – or not terribly clear to me, at any rate – about where you can find the agreement that someone else should be paid the income. But I should also make this point. There were two different types of arrangement before the Court of Session: one for footballers and one for managers. And this criticism I have advanced of the Decision may be stronger for managers than for footballers. Because footballers did enter into an agreement (called a side-letter) when they signed with Rangers in which they seem to have agreed that payments should be made to an EBT rather than to them. But Managers didn’t sign an agreement – although they too were found by the Court of Session to have agreed. The third is that we are taxed on our actual pay – and not on what we might have been paid had we negotiated a different package with our employer. We are free (at least if we do it right) to agree with our employer a package that involves us getting less stuff that does give rise to a tax liability (for example, pay) and more stuff that doesn’t give rise to a tax liability (for example, child-care vouchers or pension contributions). And if we make that choice then we pay (the lower) tax on our actual pay package rather than (the higher) tax on what we might have negotiated. I’m not sure that the Court of Session fully appreciates this. It’s not easy for an outsider – like me – to look at a case and say what the answer should be. The answer is often quite sensitive to the facts. The advocates arguing the case – and the judge or judges hearing it – know those facts better than the outsider does. And that’s a particular problem in this case. I’m not sure why – perhaps it’s because the Court of Session decided the case on an entirely new argument – but the facts relevant to this new argument are not terribly clear from the Decision. So, although I stand by the problems I have set out above with the Decision, it is perfectly possible that my analysis is wrong. You know this, of course. But it’s important that I say it. But actually my views are not nearly as important as what happens next. If there is an appeal to the Supreme Court either I will be proved wrong or I will be proved right. And whatever my view is now will be irrelevant. And if there isn’t an appeal to the Supreme Court then the fact I think the Decision is wrong will also be irrelevant – because it will remain the Decision. And no-one will care if someone somewhere (me, for example) thinks it’s wrong. So will there be an appeal? I don’t want to speculate about the financial position of whoever’s running the litigation. There are other people around who are better informed than me on that subject. But if there is money to fund it I’m pretty sure there will be an appeal. It would be an odd decision to stop at your first loss, having won twice. That’s especially true where you’ve lost on a ‘new’ point. And it’s especially, especially true where that new point is controversial. I can put my hand on my heart and say that all of the tax professionals I have spoken to about the Decision find it difficult to see how it can be right. They might all be wrong – but that sort of sentiment towards the Decision is absolutely going to encourage rather than discourage an appeal. Thanks for sticking with me this far. Even I know that tax is less fun than football. I know it now, anyway. So I appreciate you sticking around. And I’ve enjoyed engaging with many of you on twitter. Please come back for Part 3 where I’m going to talk about what I find particularly interesting about this case. Which is what I think it tells us about who the real winners and the real losers are from this kind of tax avoidance. A day or so ago, I gave an interview to BBC Radio Scotland. For a while, at least, you can listen to that interview here (at about one hour and 36 minutes in). It’s not a particularly fluent interview – but it does have one merit. I express a clear view about the decision the Court of Session gave earlier this week in the Rangers case. I say that it was wrong. That’s my view at least and I’m a Queen’s Counsel specialising in the field of tax. Although that fact doesn’t make me right, it does make my view worth listening to. After I gave that interview, I was asked whether I wanted to write about the Decision. My immediate reaction was that I didn’t. Analysing what cases mean – and whether they are rightly decided – is part of what I do for a living. What I do on this blog I do for other reasons. But I hadn’t anticipated the level of interest in my views. And the need many Rangers fans have to understand what happened to their club. And the sense of loss that – or so from many hundreds of miles south it seems to me – many feel at having had part of their identity somehow taken away or diminished. And then I remembered that I had started writing this blog because I wanted to improve understanding of the field in which I work. And that the Rangers case was one where there was a huge demand for better understanding. And so I changed my mind. In a second I’ll tell you what I’ve decided to do. But before I say anything more, I need to tell you two things. The first is that I don’t have any connection to Rangers or its equally proud rival, Celtic. I am not Scottish. I am not religious. And although I continue to follow Sunderland AFC – that being the team local to the pit village where my grandfather, Dennis, grew up – I can’t even decently pretend to be a serious football fan. The second is that, as I point out here, I do work in many of the areas I cover in my blog. And I do work in the field of Employee Benefits Trusts. I think that the only difference this makes is that it gives me a good understanding of the area. I know I’m not the sort of person who would feed you a line because it was convenient to my clients for me to do so. I know that, as I’ve explained here, my record demonstrates that that’s not what I do. But none of that changes the fact that you’re entitled to know when you read what follows that I am doing some – not much but some – work in the field of Employee Benefit Trusts. What I decided I would do is this. I would write three pieces. The first on why people use Employee Benefits Trusts; the second on why I think the Decision of the Court of Session is wrong and what happens next; and the third on what we can learn about the effects of tax avoidance from this sad tale. And I would write them for those who most need them: the fans of Rangers. And because tax is difficult, I’d try and go slowly. I’d like the third piece to get more readers than the first – I think it will be the most interesting – and to do that I’d need not to lose readers along the way. I haven’t followed the Rangers story especially closely – as I say, I don’t have any connection to the club – so please make allowances for that fact. I don’t think that will affect my ability to carry out the task I’ve set myself – but please bear it in mind if you think I’m getting something wrong. To understand Employee Benefits Trusts you need to start by understanding income tax. To acquire a liability to pay income tax two things need to happen: the first is that you need to “get” a sum of money and the second is that that sum of money needs to be “income”. If you do “get” “income” you’ll have to pay income tax on it. And that income tax will reduce the amount of money you have available in your hand to spend. I’m not going to write a long essay on what “income” is here. It’s enough for me to point out that the money that you get from the work you do as an employee is your income. The interesting bit – for my purposes here at least – is around the “getting”. Dennis’ wife, my grandmother Joan, had eight grandchildren. As each of us was born, she opened a new savings account and every week she paid money in. Not much: she didn’t work and although Dennis had not followed his brothers down the pit he wasn’t earning a fortune working as an electrician. But something: and as we turned 18 she handed the savings book over to us. Before I turned 18, the money wasn’t mine. Even though she absolutely knew that she was going to give it to me – and I knew she was too because she’d told me she was saving money for me – it was still hers. But when I turned 18 and she gave me the savings book with the entries all written in in hand (I remember this because the adding up on the final entry was wrong and the handwritten notes showed a new balance rather higher than the amount Joan had paid in and I spent many happy hours wondering whether the bank might hand over that extra. Reader, I was disappointed) and I could take the money out and spend it or give it away… Then it was mine: I’d got it. 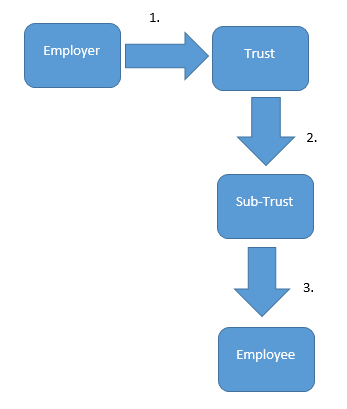 Employee Benefits Trusts are a bit like that savings account. They are a way that employers earmark money to pay to their employees in the future. A lawyer will tell you that once the employer has paid the money into the Employee Benefits Trust it doesn’t belong to the employer anymore. But it doesn’t belong to the employee either. It belongs to the trustees who hold on to it until they decide who – which of the beneficiaries of the trust – they are going to give it to. Accountants take a different view. When they draw up the employer’s accounts they ask who really owns the money. If the employer can use that money to meet its future obligation to pay its employees then they treat it just like Joan’s bank accounts. It’s one of the employer’s assets. But if control over the money has already been passed over to the employee – if Joan has given me the savings book – then it’s treated just like a payment by the employer of wages. The employer can deduct that money from its income in calculating its profit. And that’s rather good news for the employer. Because by making that deduction the employer gets to reduce the amount he or she has to pay to the tax man. So the employer wants to hand control of the money over to the employee to reduce the employer’s tax bill. But what about the employee? He’d like to – she’d like to – have control of that money too. To spend it. But ideally without having to pay income tax on it. Ideally getting in his or her hand all of the money in the trust. And because the employer benefits from keeping the employee happy – because a footballer employee who had less in his hand than he wants might otherwise decide he’s going to go play for another club – the employer has a good reason to help the employee get control of that money without having to pay tax on it. So the magic of Employee Benefits Trusts from an employer’s point of view is that they enable the employer to reduce the amount of tax it has to pay to the taxman. And they enable the employer to keep his employees happy. But only if they work. 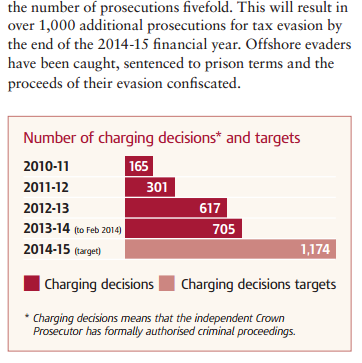 How many people has HMRC prosecuted for offshore evasion? There’s a new report of the Public Accounts Committee out today. You can read it here. Under its new Chair, Meg Hillier, it continues with many of the themes developed under her predecessor Margaret Hodge. It slams HMRC’s management of tax expenditures (a subject I tackled only a few days ago here and to which I expect to return in the coming days and weeks); it characterises as “unacceptable” HMRC’s customer service; and makes a number of detailed criticisms of how HMRC reports its progress on tackling tax avoidance and evasion. HMRC’s investigations do not lead to sufficient prosecutions to provide an effective deterrent, particularly for wealthy individuals who hide their assets offshore. That’s right, eleven in the last five years. For scale, we know that the HSBC disclosures led to HMRC becoming aware of the names of 3,600 potential evaders – and in consequence HMRC “encouraged” 500 people to take advantage of the Liechtenstein Amnesty. Offshore tax evasion really has been, as Margaret Hodge put it, “a risk worth taking” (see Question 102 here). But worse even than that is what that number – eleven in five years – reveals about HMRC’s attitude to public reporting. What we know is that in a document designed to defend its record of achieving criminal convictions in tax evasion and the HSBC Suisse tax leaks – that being its title – HMRC is relying on convictions it has achieved in benefit fraud cases. And that conclusion too is franked by this morning’s PAC report. revealing 2,962 actual and prospective charging decisions. Did only 11 of those lead to convictions? No. We can now conclude that by including that table – which includes charging decisions for such matters as wrongfully claiming tax credits – HMRC set out to mislead you as to its success in tackling offshore tax evasion. Not lying – because the document does not explicitly state that those are charging decisions in relation to offshore evasion – but an attempt to mislead. That’s a serious charge – so don’t take my word for it. Have a look at that table and the context in which it appears. Look at the document and at the page. It appears in a document about offshore tax evasion. As the screen-grab above shows, it appears at the end of a paragraph talking about offshore tax evasion. Nowhere I can see in that document is it made clear that that table has nothing to do with offshore evasion. There is some evidence that the Government is at long last taking tax evasion seriously. You can see here a series of consultation papers on new civil and criminal matters. Let’s hope those measures are delivered. Let’s hope they are utilised by HMRC. Let’s hope they work. Because the Coalition Government and HMRC’s response to offshore tax evasion by the wealthy was a disgrace. He was always rather under-appreciated, Ed Balls, and it looks now as though – at least within TIGMOO – his star has further to fall. But it shouldn’t. One rather clever insight of his during the last Parliament was to wonder whether the Office for Budget Responsibility might counteract what he then anticipated would be the critical issue for Labour in 2015: whether it could be trusted with the economy. If an independent OBR were to ‘cost’ Manifestos, and Labour’s ‘stood up’ he might gain ammunition to tackle what he anticipated would be a hostile press. And so he secured a Commons Debate on the proposal. we are not suggesting that the issues that the shadow Chancellor’s proposals present are insurmountable, but we do believe very firmly that the independence and operation of the OBR is critical. We need to make sure that independence and impartiality is preserved, and as such, Parliament would need time to scrutinise the proposals properly and the OBR still needs time to establish itself fully as an independent fiscal watchdog before being drawn into the political heart of a general election. So not now, but next time. then the hour is surely nigh. And – because Balls’ identification of the key battleground appears to have been right – the election. And Ed Balls. And all impetus to continue the push on extending the remit of the OBR. A pity for Labour and a pity for democracy – the functioning of which could only be enhanced by the electorate having a more acute understanding of what it was being asked to vote for. Anyway. I mention all of this now because earlier this year George Osborne asked Sir David Ramsden, Chief Economic Adviser to HM Treasury, to conduct a review into the OBR. He looked at a number of issues but, on the costing of manifestos, recommended against an extension. But what about the gains for the functioning of democracy? Why so readily dismiss these? The older reader, at this point, turns wearily to the Appendices and the terms of reference. What is it that Sir David was asked to consider? Ah. Nothing on the prospective gains for the functioning of our democracy. Note: Sir David’s Report was published in September. That publication passed me by; I learned of it from this blog post, by Simon Wren-Lewis. It’s a curious paradox that the delivery of the Conservatives’ desire for a smaller state, a desire born of a belief in the inefficiency of that state, throws up inefficiencies all of its own. How we laughed at the logic that led us to consider underwriting private sector investment in the nuclear power industry at a cost exceeding that which would be incurred were we to borrow and invest ourselves. And cried, at the Chancellor’s attempts to wrest from the tax system – one that already exempts the lower earning half of the adult population from liability to income tax – some meaningful amelioration of the swingeing cuts to tax credits that hit hardest that same half. My own particular cranny of expertise is, of course, neither off-balance sheet financing nor how best to balance the moral imperative to tackle poverty against the desire to run a balanced budget and properly incentivise work. What I know about is the uses that our politicians make of our tax system. But here too we find inefficiencies – borne of the same desire. And which will have profound consequences for the outcome of the Comprehensive Spending Review. Decisions around the rates at which we pay tax – cutting corporation tax to 18% or the top rate of income tax to 45% – are closely scrutinised. So, too, are decisions around thresholds: raising personal allowances to £12.500, or the point at which you pay higher rate tax to £50,000, or the threshold before a couple must pay Inheritance Tax to £1m. For changes of this type, it is relatively straightforward to identify the cost, the beneficiaries, and the advantages. But alongside these headline decisions sits a host of further choices made by Government to favour certain types of business activity, or individual, or activity. This favouriting usually takes the form of a reduction in liability to tax – and sometimes payments made to the chosen subject by HMRC. But from our perspective of course – the ‘our’ here being you and me: society at large – the form makes no difference. Either we incur expenditure by handing over cash or we forego cash by choosing not to collect that which would otherwise be our due. The technical term for these encouragements is “tax expenditures” – reflecting that through them Government is foregoing or ‘expending’ tax that might otherwise be collected. But unlike the headline decisions around rates and thresholds, the scrutiny of tax expenditures is unsatisfactory – and the evidence of their efficiency weak. But before I get into how they’re unsatisfactory and weak let me tell you why this matters. We’re talking staggering sums of money here. An Office for Tax Simplification report identified the existence of over 1,000 reliefs. The 50 tax expenditure reliefs which find their way onto the (somewhat misnamed) “principal” tax expenditure spreadsheet – these 50 alone – cost us collectively £111bn in 2014/15. That’s about 20% of all the tax of all types we collected that year. Now that I’ve piqued your interest let me explain how it’s weak and unsatisfactory. First, what the electorate is told about the purpose of these tax expenditures is often a stranger to the reality of what they actually accomplish. Last week, for example, I wrote about the so-called Shares for Rights scheme. It was heralded by Government as a mechanic to create partnerships between workers and owners of businesses. But the reality was it was little more than a £1bn bung to wealthy private equity buyers. And it appears to have been designed as such. Second, how the benefits are shared is poorly understood. Richard Murphy has given the example here of how entrepreneur’s relief (which cost a total of £2.77bn in 2013/14) delivered a tax saving of a staggering £600,000 (on average) to each of 3,000 people. True it is that Richard was able to effect that calculation from publicly available information – but the same is not true of most tax expenditures. Third, their costs – in tax revenues foregone – lack transparency. HMRC publishes three spreadsheets showing the costs attached to tax expenditures. The first – here – sets out what are described (somewhat misleadingly) as the costs of the “principal” tax expenditures. The third – here – describes the costs of “minor” tax expenditure reliefs (i.e. below £50m). But (and this is why I describe the title to the first as misleading) there is also a second – here – with the title of “cost not known”. And that second includes some punchy items – like the £1bn+ cost of Shares for Rights – which should quite clearly come within the first, “principal” tax expenditures, spreadsheet. The Shares for Rights scheme appears on the “cost not known” spreadsheet – despite the fact that Treasury promised at the time to monitor it. 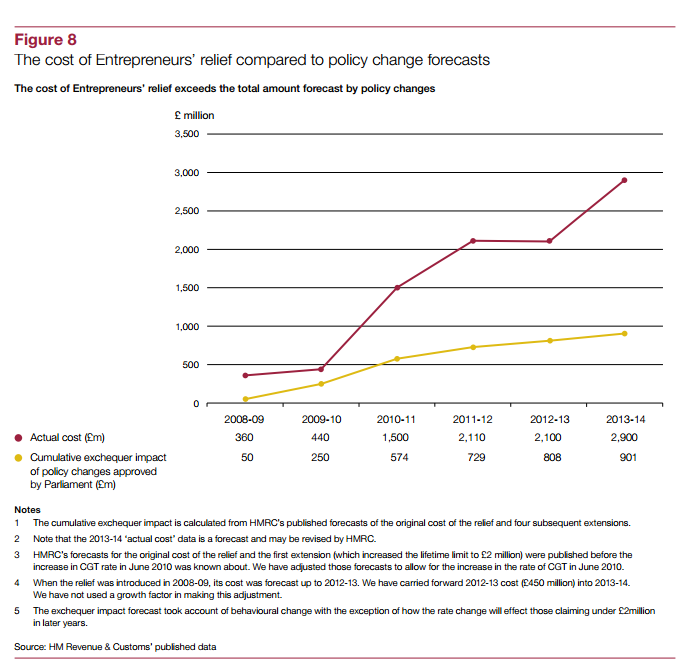 Moreover, as I pointed out in my post last week, the OBR was perfectly well able to estimate the £1bn+ cost. So you might be forgiven for some scepticism about the assertion that Treasury and HMRC are unable to. The second item on the “cost not known” spreadsheet is ‘10% wear and tear allowance.’ But how can that cost not have been known when, in July’s Summer Budget, the Government abolished the allowance, a measure that Treasury was able to estimate carried a forecast yield of £205m in 2017/18 (with more to follow in succeeding years)? But a number of the items on the first spreadsheet – misleadingly marked “principal” tax expenditures – are marked as “particularly tentative and subject to a wide margin of error.” What’s the rationale for including them but excluding lettings relief? (and that’s four of only ten reliefs the NAO examined). And, critically too, fourth, there is no ongoing assessment of whether those reliefs deliver value for money. Even if you make the generous assumption in favour of the Government of the Day that the reliefs do deliver its assessment of value for money at the time they’re introduced, the structure of that relief, its cost and what it delivers, is not routinely reviewed to take account of changes in the economic climate. Take Agricultural Property Relief from Inheritance Tax, for example. It is expected to cost us £420m in 2014/15 but what value does it now deliver? When I looked at that question here I concluded that whatever had been its original intention, it now acted as a barrier rather than a spur to the productive use of agricultural property. Or Entrepreneurs’ Relief (which I have already referred to). The National Audit Office has calculated that the actual cost is fully three times what was forecast. but there is no suggestion that this heightened level of expenditure is necessary to deliver the purpose of “encouraging enterprise”. Or even that Government has seen fit, in light of this much higher level of expenditure than anticipated, even to ask itself the question whether we get value for money from that 300% increase in the originally anticipated cost. I could go on. But you have the point. For further reading I recommend this Report from the National Audit Office and this one from the Public Accounts Committee. Given the scale of tax expenditure – over £110bn on 50 tax expenditures alone (HMRC estimate there are may be 150 in total) – these problems of disinformation, poor knowledge of costs and distributional effects, limited understanding of value for money and a lack of monitoring are profoundly troubling. So Corbyn has been right to highlight it, albeit that his particular focus on corporate reliefs is difficult to understand. But these issues rise above the party political: they ought to be absolutely centre-stage for all of us who care about efficient and well-run Government. We have been told to expect £20bn of savings in the Government Spending Review, the results of which will be announced with the Autumn Statement on 25 November. And these cuts follow, of course, from substantial cuts achieved during the last Parliament. 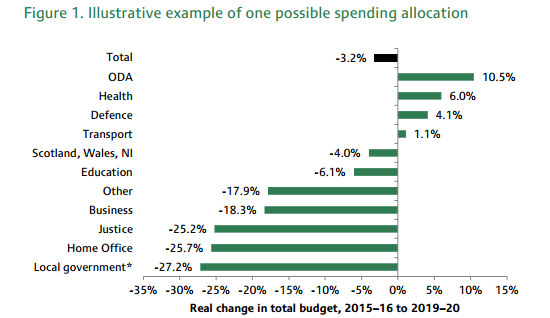 No one would argue that the Conservatives – initially with the Liberal Democrats and now alone – have failed to look long and hard at how to cut expenditure. But where is the similar detailed focus on revenues foregone? Because, of course, there is another way to achieve your goal of balancing the budget: you can increase your income. Or do a little of both. It seems bizarre that you might look to balance the books solely through the mechanic of cutting £20bn of expenditure whilst turning a blind eye to the value for money delivered by your choices to forego income. Especially when there is a tidal wave of evidence that our understanding of that value for money is poor and the sums – in excess of £110bn for fifty tax expenditures alone – are so enormous. Why would you choose to balance the books with one eye shut? In another context Government rejected this analogy between revenues foregone and expenditure incurred. And this rejection stands, apparently, despite the fact that these tax expenditures can and do take the form of cash payments made by HMRC to beneficiaries. But whatever the merits of this reasoning – and I personally struggle to identify any – it is surely a truism to say that one can balance the books as easily by increasing your income as cutting your expenditure. And you would only close your eyes to this truth if you were bent on shrinking the size of the state.